When we decided to Kickstart our own magazine, Uncanny Magazine, we’d been building up the skills to do it for many years. We had worked as editors on several nonfiction anthologies and Apex Magazine. We felt we knew how to edit a magazine that would be special based on our vision and previous successes (award nominations and increased sales wherever we were). We quite successfully Kickstarted an anthology, Glitter & Mayhem, with John Klima, who had some Kickstarter experience already. We learned a lot about Kickstarter from that project, but it’s always a challenge to move from a one-and-done project model to an ongoing magazine. We talked to magazine editors and publishers about how they did things, including John Joseph Adams, Christie Yant, Neil Clarke, Sheila Williams, C. C. Finlay, Irene Gallo, Julia Rios, and Sonya Taaffe. We talked to authors like Tobias Buckell, who has done some excellent analysis of how to Kickstart a project. 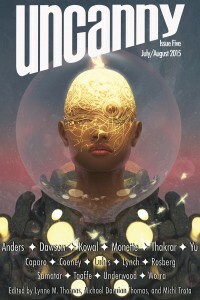 We felt the concept of Uncanny Magazine—stunning cover art, passionate science fiction and fantasy fiction and poetry, gorgeous prose, and provocative nonfiction by writers from every conceivable diverse background with an emphasis on making the reader feel —made the product intriguing. We had established a track record through our other projects, delivering what we promised on time. And finally, we had already developed a certain social media presence (Lynne had even co-authored an academic book on the subject for special collections librarians). We tried everything we could to succeed with our first Uncanny Magazine Kickstarter. We created a careful budget, brought in contributors who represented what we saw as the magazine’s mission, created nifty backer rewards, and most importantly, surrounded ourselves with a magnificent team to make the magazine as spectacular as possible. Our Managing Editor Michi Trota was a Managing Editor in her day job and possessed many skills complementary to ours. Our Podcast Editors Steven Schapansky and Erika Ensign had tremendous amounts of successful podcast production experience, Deborah Stanish has been a fantastic interviewer on podcasts and at conventions, and our readers Amal El-Mohtar and C. S. E. Cooney were well-regarded for their readings. We absolutely couldn’t have done it without the help of dozens of other friends and colleagues, too. They created art, offered generous backer rewards, filmed and edited our video, boosted our signal, and generally provided all kinds of cheerleading and logistical support that was hugely important to our success. We bought URLs and set up social media accounts on multiple platforms. We hired Katy Shuttleworth to develop the Space Unicorn mascot and Uncanny wordmark, came up with the moniker of the Space Unicorn Ranger Corps for our backers, and did a million daily ridiculous things involving costumes, drawings, guest blog posts, and other silly Internet tricks so we could keep talking about the Kickstarter without repeating ourselves too much. The Kickstarter, once launched, was wildly successful. What looked like instant success out of nowhere — we hit nearly $10K on our first day and hit every stretch goal by the end of the campaign — was the result of months of planning and laying groundwork. We really didn’t anticipate how much of our lives would be devoted to nothing but Kickstarter for a month. What we really didn’t anticipate was how much of our lives would be devoted to nothing but Kickstarter for a month. The entire Uncanny Magazine team pitched in, and we essentially worked around the clock to keep things from losing momentum. But we had no time to be exhausted. Once the Kickstarter was over, the real work began, including working with our excellent web developer Jeremiah Tolbert of Clockpunk Studios to create our website from scratch, setting ourselves up as a small business, wrangling bank accounts, taxes (get an accountant! ), contracts and payment methods, and the like. We found submissions editors. We figured out how we wanted our monthly podcast structured, and we worked with our producers to get it set up for distribution. Eventually, we even got to open to submissions and select content for the magazine. After which there was the ebook-creation learning curve (3 different formats! ), and getting set up to sell subscriptions through Weightless Books and single issues through major ebook retailers, all of which had slightly different format and submission requirements that needed to be met. Plus we reached out to advertisers. In our copious spare time, we worked on putting together our backer rewards, and getting them out to our backers. We promoted the magazine, set up a Patreon, solicited advertising, did a subscription drive, and put out 5 (shortly 6) issues of the magazine on time. We are very, very proud of the work that we’ve put out in Uncanny Year One. We think it’s some of the best work we’ve ever produced. We’d very much like to keep going. More than that, we think we can do even better. We’ve learned a lot, and know we can keep improving. So, we’re doing another Kickstarter to fund Uncanny Magazine Year Two— this time for much less money than last year. As we keep expanding our other revenue sources, we would like to run smaller and smaller Kickstarters until we don’t need them anymore. Though we think we could use this model for many years to come, we would like to watch some TV in August one of these years. 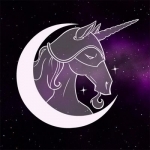 The Space Unicorn Ranger Corps is always recruiting, and we are extremely grateful for all the support we’ve received. We believe in this glorious SF/F community and want to add more art, beauty, and kindness to it. Thank you, Space Unicorns, for making that possible. 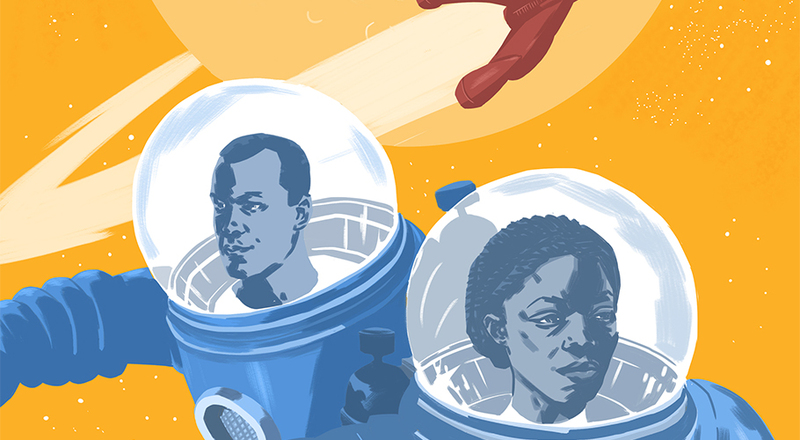 Uncanny Magazine is an online Science Fiction and Fantasy magazine and podcast featuring passionate SF/F fiction and poetry, gorgeous prose, provocative nonfiction, and a deep investment in the diverse SF/F culture. Three-time Hugo Award winner Lynne M. Thomas and three-time Hugo Award nominee Michael Damian Thomas are the Publishers/Editors-in-Chief of Uncanny Magazine. Managing Editor Michi Trota is a writer, editor, speaker, communications manager, and community organizer in Chicago, IL.